Genuine emerald, pink sapphire, and gold pendant necklace. 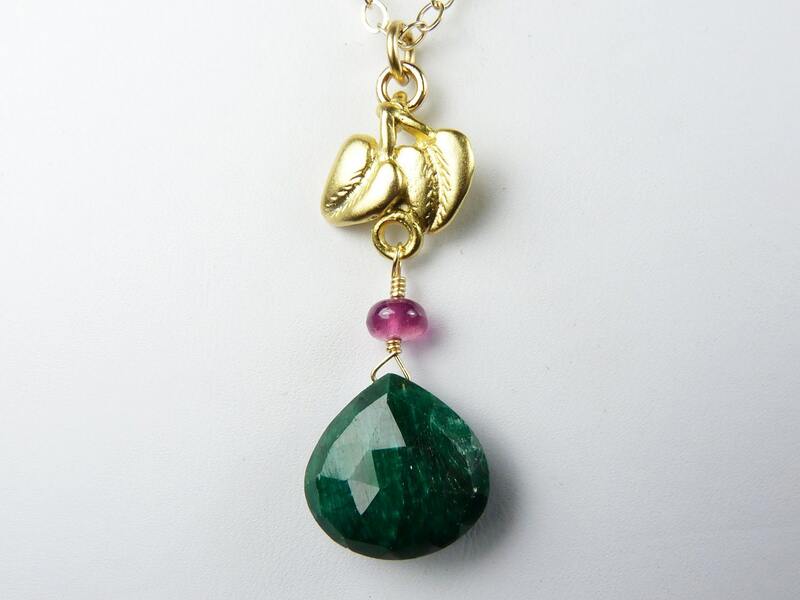 A rich forest green, faceted, genuine emerald gemstone is wrapped with 14K gold filled wire below a luscious, smooth, translucent, vivid pink sapphire and a beautifully detailed, heavyweight, vermeil (gold-plated sterling silver) leaf charm with a matte gold finish. The emerald gem is a substantial size, and it really sparkles as the facets catch the light. The emerald heart briolette measures 14mm x 14mm x 7mm (9/16" x 9/16" x 1/4"), and the sapphire is 5mm (3/16") in diameter. The pendant is suspended from a 14K gold filled ring, and it dangles 42MM (1 11/16") from a 14K gold filled chain that fastens securely with a 14K gold filled lobster claw clasp. The necklace is shown in the photographs with a 17" chain. This is a stunning and unusual necklace!